For more than a decade, I worked as the director of a downtown nonprofit and a downtown revitalization consultant for the Main Street programs in Colorado and Iowa, efforts that were based on the National Trust for Historic Preservation’s Four Point Approach to re-energize central business districts. In both states, award celebrations and downtown conferences were held in towns of varying sizes in order to give all participating communities a fair shot at economic impact and exposure to people who love to explore and travel. We became especially adept at figuring out how to lodge and host the necessary numbers, planning what years later would be coined “walking conferences” when using a variety of venues and lodging properties in close proximity, instead of staying put in one space all day. Some small and medium communities are fortunate to have large enough venues to host small conferences without a lot of moving around, but personally I don’t mind the walking conference approach one bit! Museums, recreation centers, performing arts centers and unique outdoor venues can supplement what is available in hotels or serve as the main conference hub. Often, they can be budget-friendly but may take more hands-on effort, unless the venue is well-versed at hosting meetings and events and have experienced staff to assist. In Colorado, many great towns able to host small conferences also have busy times for weddings and other social gatherings, leisure travelers and fair-sized festivals, so make sure to be on the lookout for these calendar competitors and talk to representatives of the local destination marketing organization for good timeframes. The following is just a sampling of great Colorado towns to consider for small conferences. Plus, to narrow it down even more, I went with towns that have strong downtown or central business districts that attendees will love to experience as part of the conference or on their own. It’s worth heading to the southwest corner of the state when there are amazing communities like Durango and Telluride that are ideal for small conferences. I can’t go to either town without spending time downtown, plus they both have ski resorts and are meccas for outdoor sports, beauty and culture. Durango has wonderful historic hotels downtown along with a DoubleTree that borders the Animas River and a paved recreation path. 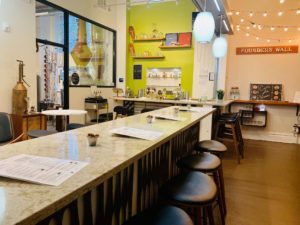 There is a fun array of breweries and distilleries to partner with, as well as a gourmet chocolate business that can customize sweet treats. River fun in Durango. Courtesy Visit Durango. In Telluride, the free gondola that runs between downtown and Mountain Village is a huge plus and is a neat way to view the stunning scenery in any season. There are quality hotels and a stand-alone conference center at the ski area base well-versed at hosting groups, such as Madeline Hotel & Residences, and some options in town as well. Grand Junction and Palisade on Colorado’s Western Slope are an appealing duo for all sorts of reasons but the wine country, orchards and lavender field angles are hard to beat. Dine among the vines and trees, work local crops and beverages into tours and tastings, and savor walking between two great venues for small or medium conferences in downtown Grand Junction, Two Rivers Convention Center and Avalon Theatre. 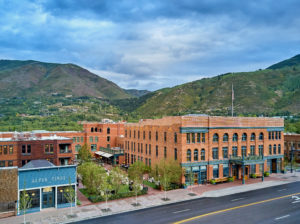 Head east on Interstate 70 from these two communities, and your path will cross with Glenwood Springs. 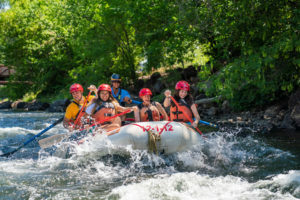 With two hot springs, Glenwood Caverns Adventure Park and a bustling downtown, it was the perfect place to launch the first-ever Hot Springs Connection, a three-day conference in November 2018 that welcomed nearly 100 attendees from 14 states and three different continents. Glenwood Springs also is the gateway to Aspen (located to the south) with loads of options and name recognition that’s hard to ignore. Plus, Snowmass is a worthy neighbor and place to consider for small conferences. In Aspen, Hotel Jerome’s latest renovation involved the courtyard and the Aspen Times Building. Photo by Shawn O’Connor. Steamboat Springs also has hot springs for pure relaxation and lodging/meeting options at The Steamboat Grand, just steps from the slopes for year-round fun. Speaking of legendary ski towns, Vail attracts a global crowd and is a straight shot west from Denver on Interstate 70, where there are a variety of great ski resorts to consider like Copper Mountain, which has a conference center. It is magical to stroll Vail Village at night and ice skate in the heart of Lionshead. There are several hotels in Vail that purposefully partner to host groups or can host small conferences on their own. Exit earlier to traverse up to Winter Park or consider taking the Amtrak Winter Park Express and be delivered slopeside on select days during winter. 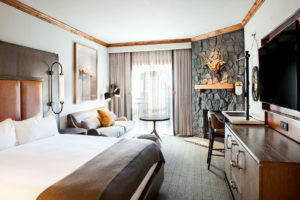 Renovated guest room at Vail Marriott Mountain Resort, part of a $25 million makeover. Courtesy Vail Marriott. 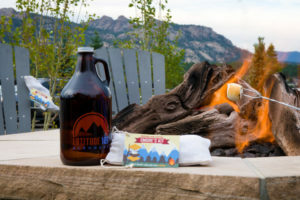 Estes Park has grown by leaps and bounds as a travel destination since I was young growing up in Greeley and frequently staying at a cabin belonging to family friends in nearby Glen Haven. The Estes Park Events Center, The Stanley Hotel, The Ridgeline Hotel, and YMCA of the Rockies Estes Park Center offers a diverse range of options for a wide variety of groups and budgets. Perfect way to wrap up a day of meetings in Estes Park. Courtesy The Ridgeline Hotel. Other worthy small conference towns surrounded by peaks include neighbors Buena Vista and Salida in Chaffee County. Mt. Princeton Hot Springs Resort near Buena Vista and the SteamPlant Event Center along the banks of the Arkansas River in Salida are terrific options. Less than two hours away is funky and fun Crested Butte, with a ski resort just up the hill in Mt. Crested Butte that has meeting and event space and activities for small conferences. The list of options could go on and on, but Golden, Longmont and Greeley on the Front Range are worthy of shout outs. Fort Collins, Loveland and Boulder are able to host medium-sized conferences, but also can certainly scale back like even larger cities to go small. Lots of choices, so match up what works best for your budget, attendee profile and conference focus. Happy planning! Dry Land Distillers’ new tasting room in Longmont. Courtesy Dry Land Distillers. Beth Buehler is editor of Colorado Meetings + Events and Mountain Meetings magazines, has planned numerous meetings and events and enjoys exploring Colorado in all seasons.